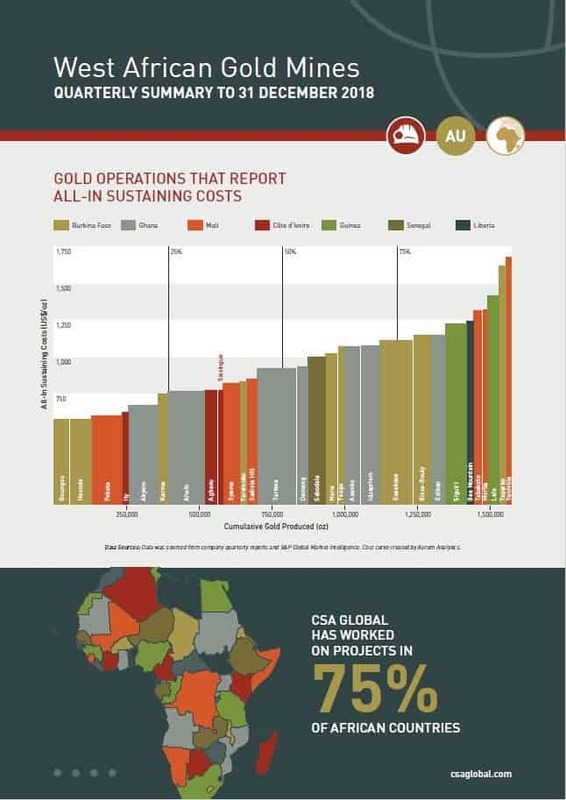 Welcome to the latest edition of the West African Gold Mines Quarterly Summary produced by CSA Global. For the quarter ending 31 December 2018 reported gold production totalled 2.04 Moz, with Ghana, Burkina Faso and Mali accounting for 77.9% of the production. Randgold’s Loulo mine in Mali once again was the largest gold producer with 192,043 oz, followed by Gold Fields’ Tarkwa mine (134,000 oz) in Ghana and Newmont Corporation’s Ahafo mine (128,000 oz) in Ghana. The average gold price (London PM Fix) for the quarter was US$1,227/oz. The average reported All-in Sustaining Costs (AISC) was US$999/oz and to be considered in the lowest cost quartile an AISC of less than or equal to US$769/oz was required. The mine with the lowest reported AISC was SEMAFO’s Boungou mine in Burkina Faso with an AISC of US$579/oz, this was followed by Endeavour Mining’s Hounde mine (US$580/oz) in Burkina Faso and B2Gold’s Fekola mine (US$600/oz) in Mali.